When it comes to drinking spirits, the discerning gent likes his poison the finest possible and with plenty of depth. Bourbon is a category that fits this bill and sits high on the list of favourites within the drinks cabinet. But how much is known about the dark amber liquid itself? Fear not. Elysium Magazine, as part of the Discerning Drinker series wants to educate, one tipple at a time. Here, the mighty bourbon is examined through the lens of an expert, on this occasion Jackie Zykan – Master Bourbon Specialist at Old Forester Bourbon – to navigate the discerning gent through the bourbon category. Elysium Magazine (EM): The discerning gent is a fan of bourbon but there’s plenty about. What’s the difference between the various types available? Jackie Zykan (JZ): We define bourbon by using the ABC: it has to be made in America, it has to use a new, charred, oak barrel and the whiskey needs to be minimum 51% corn. The variety of bourbons comes from different ages, yeast strains and mash bills along with the wood characteristics that impart most of the flavours. Some bourbons are spicier, coming from a heavier rye balance, wheat is a little softer. Different levels of vanilla notes will be savoured on the palate. But, just because you like one bourbon that may carry more wheat, it doesn’t mean that you’ll like all wheated bourbons. To find what you like, is a happy problem – lots of sampling required! EM: If there is one thing I should always remember about drinking bourbon, what would that be? JZ:…that there are no hard rules about the way to drink bourbon. You can have it any way you like, whatever way is comfortable for you is the right way to drink it. If you’re a bourbon novice, I would try light cocktails such as the Whiskey Smash or Whiskey Sour; both are fairly juice-laden, lightening the stronger characteristics of the bourbon without masking its essential flavours. EM: How important is the glass used when drinking bourbon? JZ: Different glasses will highlight different characters and aromas of bourbon. The Glencairn whiskey glass, in my opinion, is the best to maximise the whiskey. It focuses the nose with the taper at the top of the glass. This is the best way to taste a whiskey ‘neat’. Bourbon cocktails are served in a variety of different glassware, a stem on the glass prevents warming of the cocktail ensuring it is served cold. Highball glasses maintain the carbonation of a mixer and a nice rocks glass or tumbler accommodates a large piece of ice if you want it to consume it ‘on the rocks’ or with a splash of water. A whiskey sour in a vintage, champagne glass offers a bit of classy elegance to your cocktail. EM: When drinking bourbon, should it be neat, with water or with ice? Or, what mixer should be used? JZ: However it’s enjoyable to you is the right way to drink bourbon. When I guide tastings, I encourage folks to drink it in its pure form first, and then when you add ice or water, it elevates the flavours, opening them up and pulling them out. As far as mixers go, bourbon is very versatile. You can substitute it for any base spirit for any cocktail. It works best with mixers that complement the natural flavours of bourbon, such as vanilla, baking spices and caramel. Old Forester is best highlighted with citrus for its citrus notes, anise and cinnamon. It’s weirdly fabulous in a pina colada! EM: How should a discerning gent be drinking his bourbon? Talk us through the steps. JZ: First, spend some time embracing the aromatics by nosing the glass with your lips parted. Then take an initial sip to adjust your palate to the warmth of the alcohol. With your second sip, allow it to coat the inside of your mouth and really take a moment to let all of the flavours sink in. On your third sip, you will really start to experience the complexities of the flavour and note some of the distinctive characteristics of the bourbon you are sipping. It’s at this point with Old Forester that you will really sense the depth of barrel influence. EM: If I wanted to impress my friends/boss/father-in-law when at the bar, what bourbon drink should I order? JZ: While new in the UK, Old Forester is a brand that perfectly exemplifies the category of bourbon, by ordering an Old Forester at the bar, you have an opportunity to tell a story. You’ll also show you’re in the know. As America’s First Bottled Bourbon, Old Forester has been around for 145 years, it’s an icon in the bourbon category. The quality and history behind this bourbon has been worth holding onto. THIS is the standard of Kentucky Bourbon Whisky. Ordering a Woodford Reserve will also show off also impeccably good taste and an appreciation for a more robust style bourbon. EM: Tell us more about your role with Old Forester bourbon? JZ: I’ve spent more than a decade learning about whiskey, teaching others how to savour it, enjoy the different notes in every glass and how to turn it into a great cocktail. I worked as a bartender then beverage director and this role combines my skill set with my love of excellent whiskey! As the Master Bourbon Specialist for Old Forester, I get to work with the best folks behind the bar, traveling the world talking about great bourbon and sharing this amazing story of one family behind this brand. The same family is still leading us today. 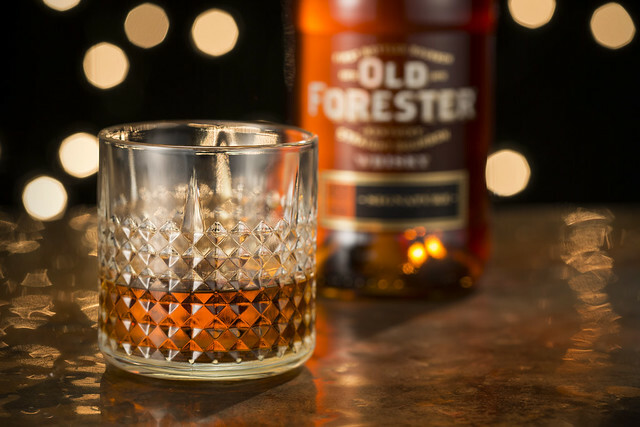 As you make your choice of what to order, what to buy at the store or how you’re going to drink it tonight, my goal is to help you feel the passion that I do as you chose, Old Forester.